OMAHA, NE – If you are not able to volunteer for any of our events, you can do a great service by donating to our cause. The Nebraskans for Equality Blog is part of a nationwide movement to change the conversation on the LGBT movement called The Equality Pledge. 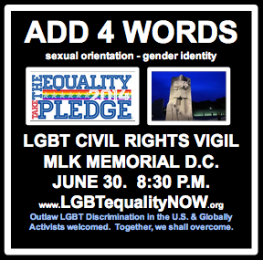 The Equality Pledge stresses the LGBT Community and supportive elected officials come together to push for Full Federal Equality which involves a one bill strategy to add sexual orientation and gender identity to a broad of list of laws already granting existing protected classes protection in areas including: Public Accommodations, Public Facilities, Federally Funded Programs, Employment, Housing, Education, Credit, Federal Marriage Equality, Immigration, Disability, and Family Leave. 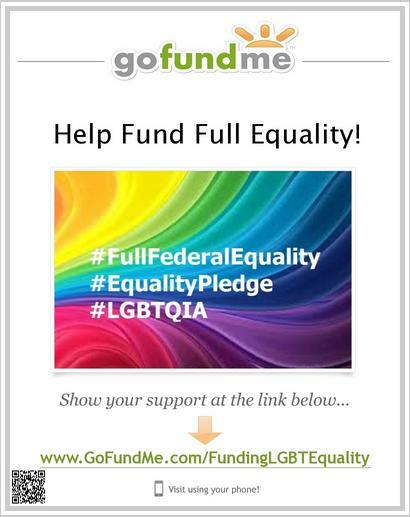 To help us move equality forward, just a $5 donation can go a long way to reaching our goals for Full Federal Equality under the law. Will you donate to help fund equality?